Since I was a kid, Girl Scouts have added another level for younger kids below Brownies, so Genevieve is a Daisy this year. She could have done it last year, but no one wanted to help me lead the troop, and I wasn't dumb enough to do it alone. This year another woman stepped up to the leadership position, and I am "helping." At their first meeting they made Daisy smocks to use as their "uniforms" and learned all that GS stuff like the GS Promise and the Friendship Squeeze. I am a little peeved that the GSP is still "On my honor I will try to do my best to serve God and my country ..." GSA goes overboard with showing girls of different races/ethnicities at every opportunity, yet they still stick to the old religious underpinnings that come entirely from Christian doctrine. (I haven't heard much about their stance on homosexuality, but I assume it's similar to the Boy Scouts, who are known for being intolerant.) It makes me feel like their message of inclusivity is a load of crap. The current leader is completely oblivious of course, and I think all the other girls in the troop are white and Christian (except for one part-Hispanic girl who was adopted into a white family). I'll be less grumpy about it once they stop doing Christmas activities. On Saturday we sold GS cookies at a booth outside a local dairy owned by one of the girls' family. This is so much better than the door-to-door method! After my horrible experience with that, I'm not sure if I'll ever let her go door-to-door anyway. 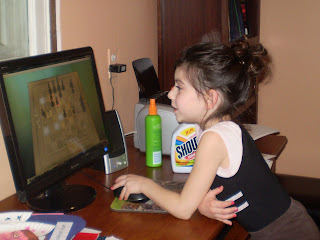 After that Genevieve went to a birthday party at Sweet and Sassy, a salon for young girls started by a marketing genius. They all got updos, nail polish, blush, sparkle spray, and put on costumes to dance under a disco ball. Actually the GSUSA does allow alternative wording on the promise. "The word "God" can be interpreted in a number of ways, depending on one's spiritual beliefs. When reciting the Girl Scout Promise, it is okay to replace the word "God" with whatever word your spiritual beliefs dictate." This allows a great deal of leeway such as Allah, "my religion" (which is close to what Thai scouts have always used), to 'serving the highest good' or whatever fits the scout's beliefs. That's all very nice, but it still assumes that everyone believes in some sort of higher power. Which I most certainly do not. Plus there is no way that one little girl out of the group is going to say something different. It just shouldn't be in there.